You can sample the Olympic Discovery Trail by biking an easy day trip that begins just north of Sequim’s city center and ends at the beautiful Dungeness River. This 5.9 mile trip is relatively flat with a paved, wide path, making it a great introduction for all levels of cyclists. This trip will begin with sweeping views of our valley and farmlands that grow our famous lavender. Down the path you will see Railroad Bridge Park. This large timber bridge was built in 1915 and the rail line that used it transported primarily timber until 1980. The bridge was recently renovated and reopened in 2016. Before crossing the bridge make sure to stop by the Audubon Center on the right. This is a perfect spot to have a picnic lunch, refill your water bottle and use the restrooms provided. Inside the center you can learn about local wildlife with hands on exhibits. The center also offer seasonal classes such as: birding, watercolor painting, photography, ecology, and native plant gardening. There are several side trails you can hike at the center too. Once you reach the bridge you will have a perfect chance for bird watching. Keep an eye out for bald eagles, woodpeckers, finches, wrens, warblers, nuthatches, and sparrows. Our spring and summer birds include: Olive-sided Flycatcher, Western Wood-Pewee, Swainson’s Thrush, Black headed Grosbeak, and Bullock’s Oriole. 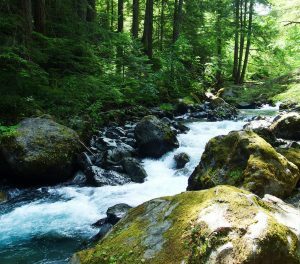 As you continue down the path enjoy the views of the shimmering Dungeness River. Then it’s a serene bike ride back home to Sequin where you can refuel at one of our many wonderful restaurants. Looking for a group to join and start your biking adventures? Sequim has several options that welcome all ages and abilities. These groups offer many day and time options to fit your schedule. You will enjoy exercising in great scenery and making new friends all at the same time. Find your biking community and hit the trail. If you need to rent a bike for the day or looking to purchase the perfect bike, Sequim has several excellent bike shops. Ben’s Bikes offers rentals and has a wide range of options including; mountain, comfort, road, children’s bikes, and even doggie buggies for your small, furry family members. If you call ahead they will deliver to certain hotels, B&B’s and inns for your convenience. If you’re in the market for a new bike or your old bike could use a tune up, they can help. Sequim locals also depend on All Around Bikes when purchasing and maintaining their bikes. They are a full service bicycle repair shop as well. Both offer warm, friendly service and will help you get out and bike our beautiful Olympic Discovery Trail. 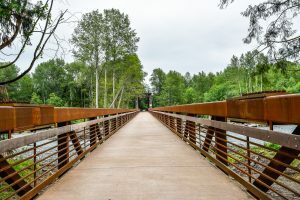 Come visit our charming, bike friendly community, and experience the tranquil beauty along the Olympic Discovery Trail. It is a wonderful place to find an adventure that fits you, from casual cycling to fast paced mountain biking. It is the perfect town for avid cyclists to call home. If that sounds like your ideal location, contact one of our knowledgable Real Estate Agents. We’d love to help you find a place in our special town.